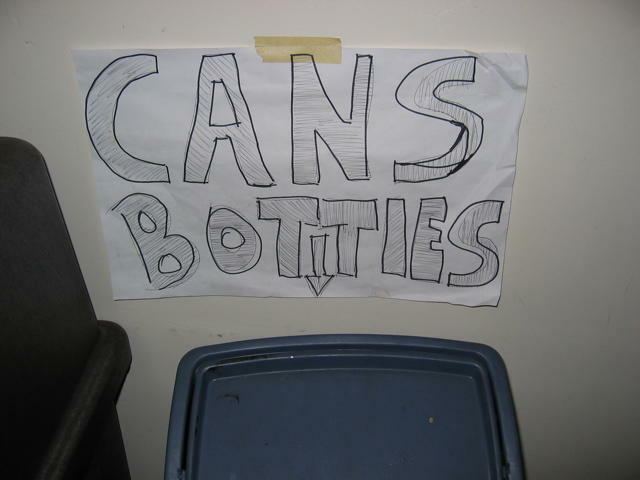 This sign for recycling "CANS BOTTlES" in a 7th Ave. pizzeria in Park Slope is about as good as lowercase L gets! Notice that this sign was not just simply scribbled in haste. The author took great care to draw block letters and fill them with shading. So why suddenly shift gears from all uppercase with a randomly lowercase L? I'm telling you, the propensity to use lowercase L's in uppercase words has got to be some sort of genetic abberation. I suppose the "O" could arguably be considered lowercase as well, since it is slightly shorter than the letters to its left and right, but to me this looks like a perfect set of all uppercase words with a single lowercase L.
I love this one... I think the guy realized he was gonna run outta room so he lowercased the L so everything would fit. That being said, it's odd that that would be concidered an acceptable space saver. Yes, I have to agree too. This is a bona fide lower caser. Upon closer inspection of the magnified photo, I take back my comment about the artist having carefully shaded his block letters. It looks like it may have been the other way around: Seems like the artist first drew the block letters with a dull pencil and shaded them in. Then, when he realized the words were too light to read, he outlined them with a thick black marker. Tova, you may be right, he was pretty optimistic when he wrote the first half of "BOTTlES", just look how much space is between B O T!